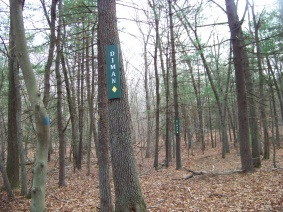 The Diman Trail is a shorter trail of the hiking trails in the Holbrook town forest. 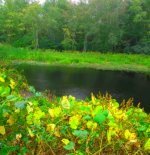 This trail is accessed exclusively from the Long Trail in the area that is considered the early part of that trail. This trail runs about midway down the Long Trail between the trail head and junction with the Wiggins Trail. It is well marked like most the trails in this forest. It is blazed with yellow diamonds. At the trail junction with the Long Trail, taking the Diman Trail to the left brings you in a northerly direction that will take you to a spot on the power lines that border the towns of Holbrook and Braintree. You can then make a loop by taking a right at the power lines to access the Wiggins trail which will be on your right. trail lead to the left but that will not make this a short loop. If you would like a longer hike you may follow the Long trail to the left to it's end on the upper portion of the Wiggins trail hiking back down to the Long trail section that brings you back to the trail head. Back at the original trail junction of the Long trail and the Diman trail turning to the right on the Diman Trail brings you up an almost unnoticeable incline along a very pleasant stretch of woods. The trail however seems to end in a nearby residents back yard. Hopefully this trail will be developed more and made to loop back to one of the other trails. What I like about the Diman Trail is that this trail is one of the dryer trails in the forest and not as littered with rocks making it one of the easiest to hike trails in the town forest. from Boston take route 93 south and route 3 at split. Take exit 16 route 18 south. Right at next intersection onto West st. 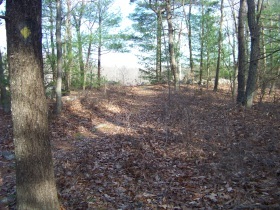 This becomes Grove at Braintree line. Follow til intersection with Liberty st. This becomes Pine St at Holbrook line. Look for Long Trail on left. One car on Pine St. at Long trail entrance. snow shoeing, x-country skiing as an extension of the Long Trail.